Saudi Arabia’s Crown Prince Mohammed bin Salman has arrived in Tunisia as hundreds of people staged protest rallies across the North African country, denouncing the kingdom’s de facto ruler as a murderer of prominent dissident journalist Jamal Khashoggi, who was killed after visiting the Saudi consulate in Turkey’s largest city of Istanbul last month. Bin Salman told Tunisian state television late on Tuesday that Saudi Arabia and Tunisia have long had good relations. “I cannot come to North Africa without visiting Tunisia …Tunisian president (Beji Caid Essebsi) is like my father,” he added. 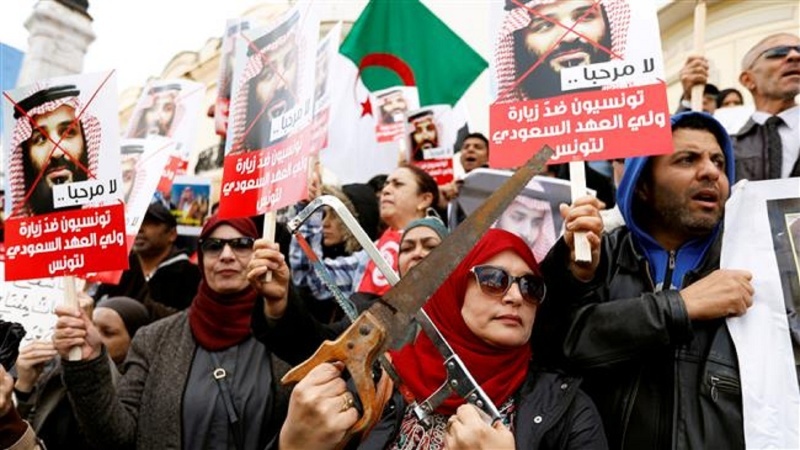 Earlier in the day, protesters marched through the central Habib Bourguiba avenue in the capital Tunis, on the second day of demonstrations against the Saudi crown prince’s visit to Tunisia. “The reasons that encouraged me to take part in this demonstration are that this person, can be blamed for two things. First the massacres that are taking place in Yemen and he is clearly responsible for that. Children are dying as well as the hunger, poverty and misery in Yemen. “Second, this man is against all liberties, any form of liberty, (including) freedom of expression of the press, of women, and of the emancipation of women. What would be positive enough to welcome him?” university professor, Chedli Nafti, said.